Though less obvious than Deadheads braying ‘Iko, iko’ out the window as they float past each other in psychedelic Westfalias, there’s a significant subculture of Jeep weenies in Wranglers who always salute each other in traffic. They simply love driving these mechanized Sherpas. Not that you’d have seen many other Wrangler drivers, or traffic for that matter, last month on my friend’s farm on the Niagara Escarpment. It’s where we tested that Trail Rated badge you’ll find on the Jeep Wrangler Rubicon Unlimited. According to Jeep.com, the trail rating is granted only after a vehicle has performed well in “five categories of off-road conditions: traction, ground clearance, maneuverability, articulation, and water fording.” By the way, Rubicon is the legendary Californian trail where the Jeep’s are testeted, as opposed to something you need to know for your grade 11 English exam. Ground clearance and maneuverability? Check. We climbed a double-black diamond ski trail disguised as a waterfall, popping around and hopping upon the odd hay-bale mogul. Articulation for Jeep means keeping the wheels in contact with the ‘ground,’ even when, for us, that meant deep mud for three trails and bumpy slate for the remaining one. It was a rainy weekend and, thankfully, we hadn’t removed the soft roof. So when we hit the gas hard in second gear, the Rubicon’s the 17-inch all-terrain tires behaved like talons, flinging filth everywhere, but yanking us from the mud. 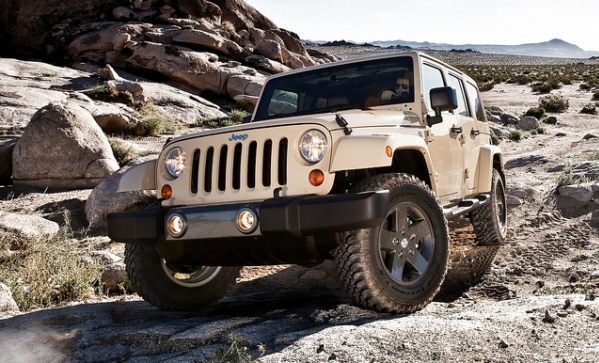 The Wrangler can reportedly travel through eighteen inches of stream. We never got past a foot but no one’s complaining. It was a fun few hours. Back on the road, our hearts slowing to regular pulse, we passed another, much older, but just as filthy, Wrangler. I tipped my head a couple of inches and saluted.